Hi loves! Hope you all had an amazing weekend and a happy Easter! 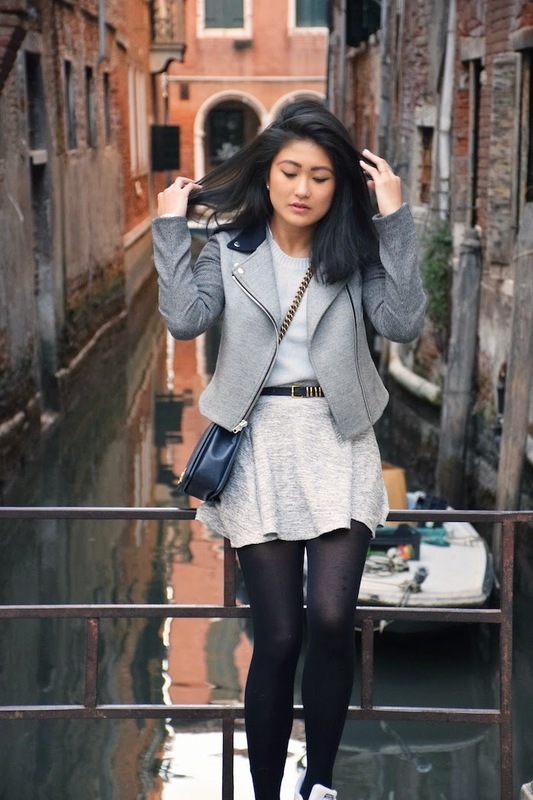 Here's what I wore during Venice on my Italy trip! Unfortunately it was still pretty chilly and I had to wear tights, but Venice made up for all of that. The entire experience was absolutely amazing--from the romantic gondola ride to getting lost in their side streets to pigging out on gelato three times a day (to be honest, we did that everywhere in Italy...and found pretty amazing spots everywhere we went...so if anyone is going any time soon, I have plenty of recommendations haha). Stay tuned for more photos of my Italy trip...and videos once I figure out how to edit them properly! love the zipper detail on your jacket. You look so beautiful Samantha!! I am really jealous of all your wonderful travels-I am glad you're documenting and sharing with us. Gelato three times a day sounds divine. You officially have the best bags! Kenapa Penderita kanker Usus Harus Banyak Makan Serat ? Starring Samantha x Fresh Tangerine Giveaway!